Summary and Definition: The Huron tribe originally inhabited the area north and west of Lake Simcoe and south and east of Georgian Bay. They were farmers, hunter gathers and expert fishermen who made excellent use of their birchbark canoes for hunting and trading expeditions. The Huron were firm allies of the French and fought with them in the Beaver Wars and the French and Indian Wars. Their main enemies were the tribes of the Iroquois Confederacy who forced them from their homelands. What was the lifestyle and culture of the Huron tribe? The Huron tribe were originally members of a confederation of four Iroquoian tribes consisting of the Neutrals, Tionontati, and Wenro and the Huron. They were a tribe of farmers, hunter-gatherers and fishermen who made excellent use of their birchbark canoes. The light and swift birchbark canoe enabled the Huron to travel great distances along the rivers and across the lakes in their region to trade their agricultural surplus. Their trading expertise and their ability to travel long distances were seen as great assets by the French who quickly allied with the Huron to gain an advantage in the lucrative beaver fur trade. The French and the Huron became allies and subsequently fought in the terrifying and brutal Beaver Wars (1640 - 1701) against the powerful Iroquois Confederacy. Warfare with the powerful Iroquois forced the Huron to migrate from their tribal territory, European diseases and continuous conflicts, including the long running French and Indian Wars (1688 - 1763), took their toll on the Huron people. The Huron and the Petun tribes joined together and became known as the Wyandot people and settled in the area of Ohio and southern Michigan in the United States. The Wyandot were subsequently relocated to Kansas and Oklahoma for the 1830 Indian Removal Act. This article contains fast, fun facts and interesting information about the Huron Native American Indian tribe. Find answers to questions like where did the Huron tribe live, what clothes did they wear and what food did they eat? Discover what happened to the Huron tribe with facts about their wars and history. What language did the Huron tribe speak? The Huron tribe spoke in the Wyandot dialect of the Iroquoian language. The were called "Hurons" by the French, meaning "bristly" or "savage haired" in reference to their coarse black hair that extended in a mane from the forehead to the nape of the neck, and decorated with a stiff roach headdress. The Algonquin people called then the "serpents". The people called themselves the 'Wendat' meaning "People of the Peninsula". 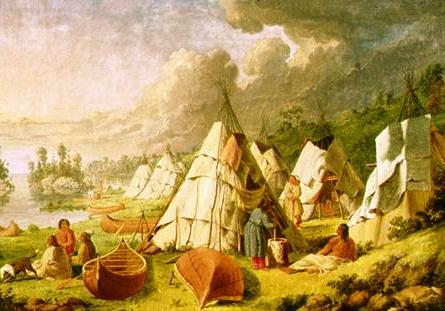 The name Wendat was written by the English as "Wyandot." Where did the Huron tribe live? The Huron are people of the Northeast Woodland Native American cultural group. The geography of the region in which they lived dictated the lifestyle and culture of the Huron tribe. What clothes did the Huron wear? The simple clothes worn by the early Huron people were made from animal skins or birch bark. The clothes worn by the men included breechclouts, leggings, shirts, long cloaks and shoulder to waist length mantles. The blackened skins of deer (buckskin) and beaver were used to make their clothing and borders were often dyed red. Huron women wore wraparound skirts, dresses and cloaks. The Europeans introduced trade cloth to the Huron tribe who then began to adopt a more European type of dress. What did the Huron tribe live in? The Huron tribe lived in large, densely populated, fortified towns of Longhouses that covered from from one to ten acres. Some of their birch bark houses were 200 feet long, 20 feet wide and 20 feet high and housed as many as twenty families. The windowless Longhouses had a rounded roof and doors at both ends. The densely populated, longhouse towns served the Huron well for hundreds of years but made the Huron vulnerable to European epidemics. When they travelled they built temporary shelters known as wigwams. Wigwams were built with wooden frames that were covered with woven mats, sheets of birchbark and animal skins. The Huron tribe were skilled boat makers and built canoes made of strong and water-resistant birch bark that could be easily bent, cut and sewn. The Huron birchbark canoes were important for the tribes way of life and their ability to make successful hunting and trading trips during the summer. The Huron hollowed out logs using fire and then the birch bark was stretched over a strong, lightweight, wooden frame to make a birch bark canoe that could be easily manoeuvred and steered. The ribs of the canoe were made of tough hickory, cut into long, flat pieces, and bent to the shape of the boat. The Huron canoes measured about seven metres long and one metre wide and could carry four or five men and about 91 kilograms of cargo. The birch bark canoe was perfect for travel along fast streams, rivers and shallow waters and were sturdy enough for the rough waters of the lakes. The food that the Huron tribe ate included crops of corn, beans and squash that were raised by the women. Tobacco was also farmed by the men. Fish such as sturgeon, pike and a variety of shellfish such as clams, oysters, lobsters and scallops were an important part of their food supply. The Huron men also provided meat from deer (venison) and smaller game like squirrel, rabbit, wild turkey and duck. The Huron food also included nuts, vegetables, mushrooms and fruits (blueberries, strawberries, plums and raspberries). Sunflowers were also grown for their oil which was used in food and as a body rub. What weapons did the Huron use? The weapons used by the Huron warriors included bows and arrows, war clubs, tomahawks, spears and knives. Huron History: What happened to the Huron tribe? The following Huron history timeline details facts, dates and famous landmarks of the people. The Huron timeline explains what happened to the people of their tribe. For additional facts and information refer to the Story of Piskaret.